My recent business trip to New York was the first time in almost two years that I had been away from my wife and daughter for a prolonged period. It was a rather unnerving experience being away from my eighteen month old daughter, but it was also a rare moment where I could indulge in a few days of fine dining. After all, there was no point in being miserable when you had so many fine dining establishments at your footstep was there? The difficulty was choosing which ones to go to. I had three meal slots free so I had to choose wisely. The first one was a no brainer for me. 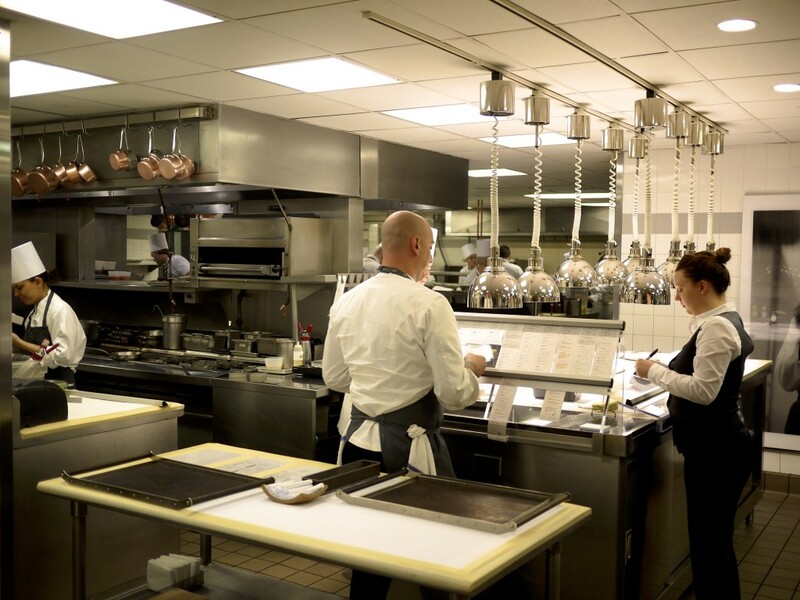 Daniel Humm’s Eleven Madison Park had consistently maintained the title of Best Restaurant in North America for three years on San Pellegrino’s list and was recently voted as the Chef’s choice. What’s more, Chef Humm was from my native country of Switzerland. Surely I had to support my countryman. 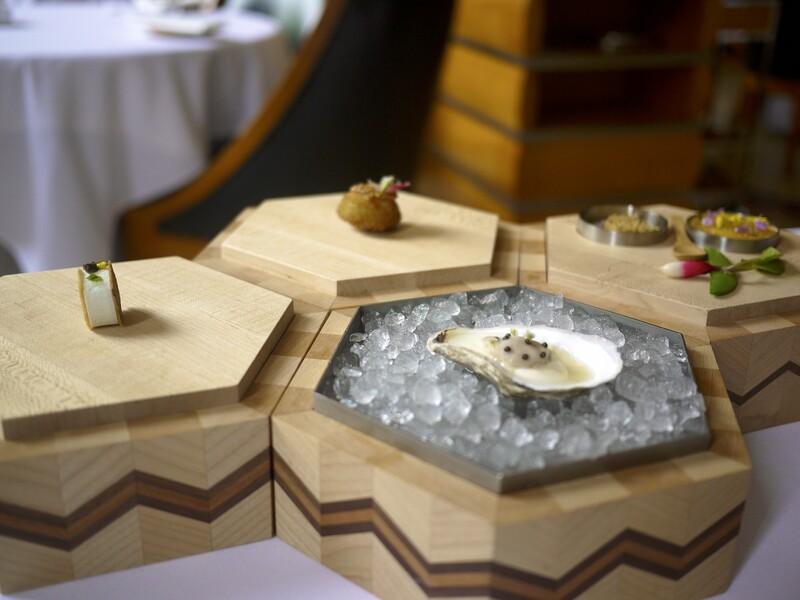 At USD 295 a tasting menu, Eleven Madison Park doesn’t come cheap but then again they’ve done away with the US customary act of tipping, stating publicly that it is neither expected or accepted. 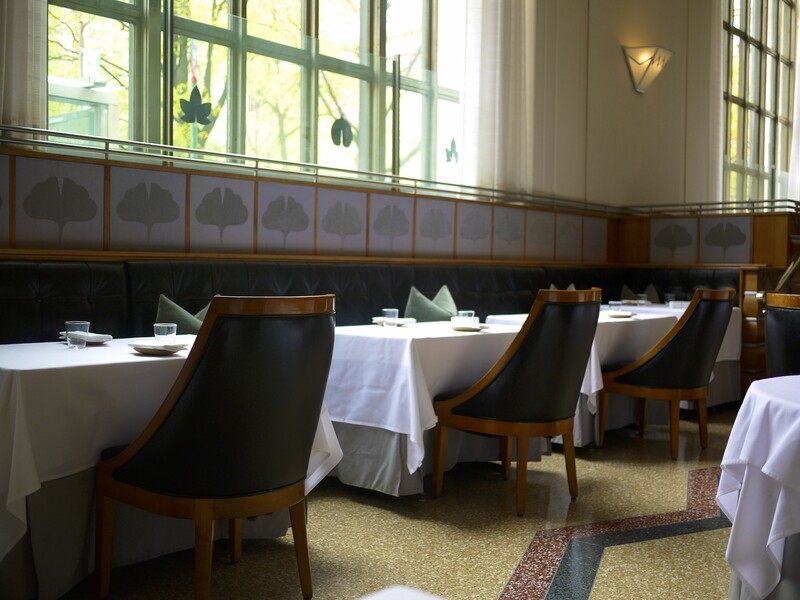 With soaring ceilings, marble floors and natural light flooding in from the massive windows overlooking Madison Square Park, the dining room is anything but modest and, whilst the front of house was slick, observant and professional, they could not have been more hospitable and personable. After spending a few days alone in Washington before arriving in New York, the friendly banters and chats were exactly what I needed to recharge my battery. More importantly, my stomach had not been coping with the high fructose American diet so I was eager to tuck into something more agreeable. The wine list was dominated by the old world and to be very precise, France. I was a bit disappointed that I was not be able to match my meal with a selection of American wines as I was hoping to explore the USA through the sommeliers eyes. 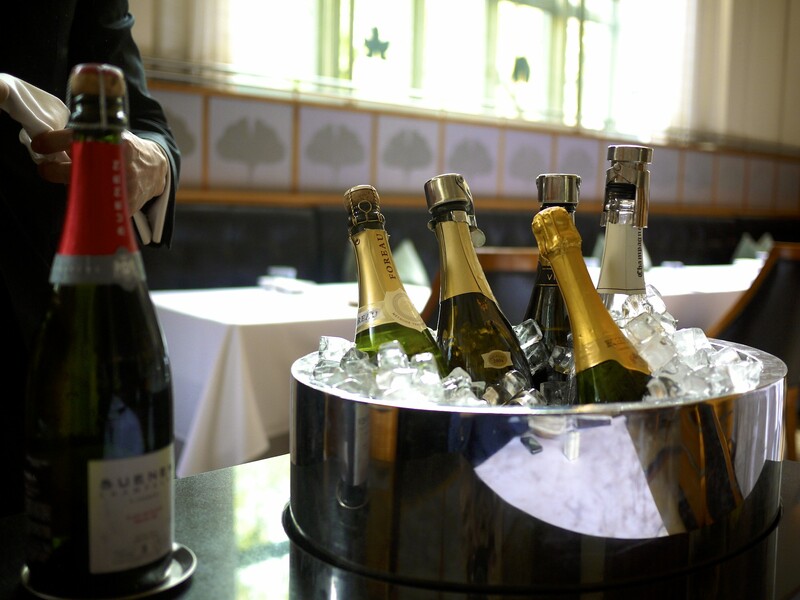 Nevertheless, I opted to start my meal with a glass of their mineral driven Suenen, Blanc de blanc, Extra Brut, Cramant. 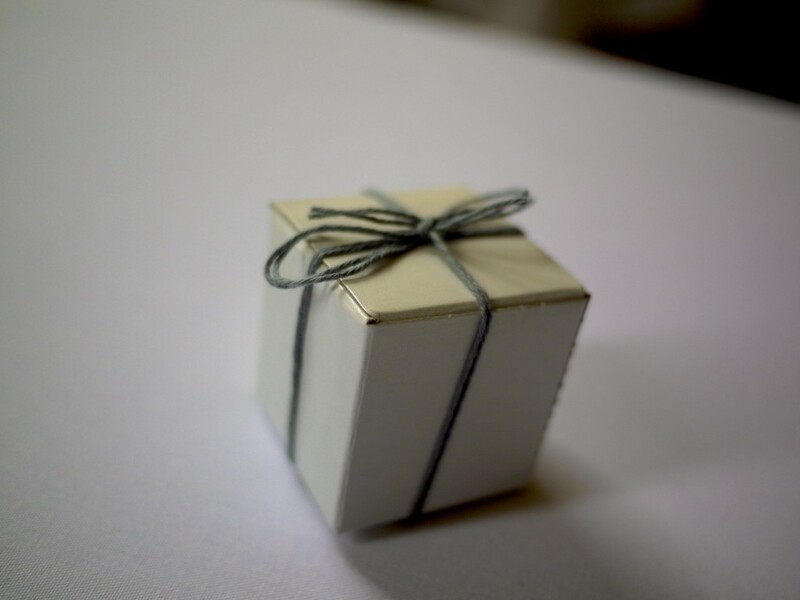 The box contained a modern twist on the classic New York snack, traditionally consisting of a vanilla and chocolate fondant. 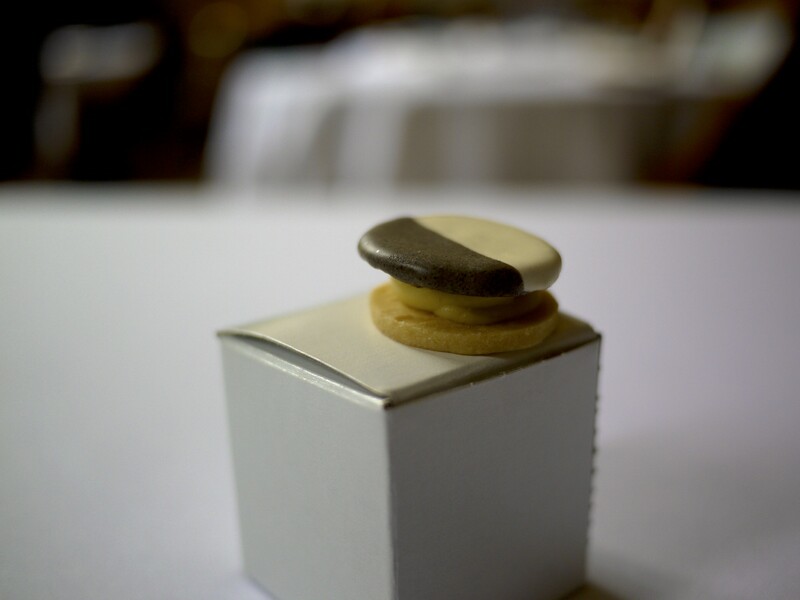 Not having ever tried the classic cookie, Chef Humm’s homage to the city that adopted him was perhaps lost at little in its meaning on me, but it was a nice little introduction to whet my appetite. Just as soon as my empty box was taken away another staff member brought over a hexagonal tower to my table. 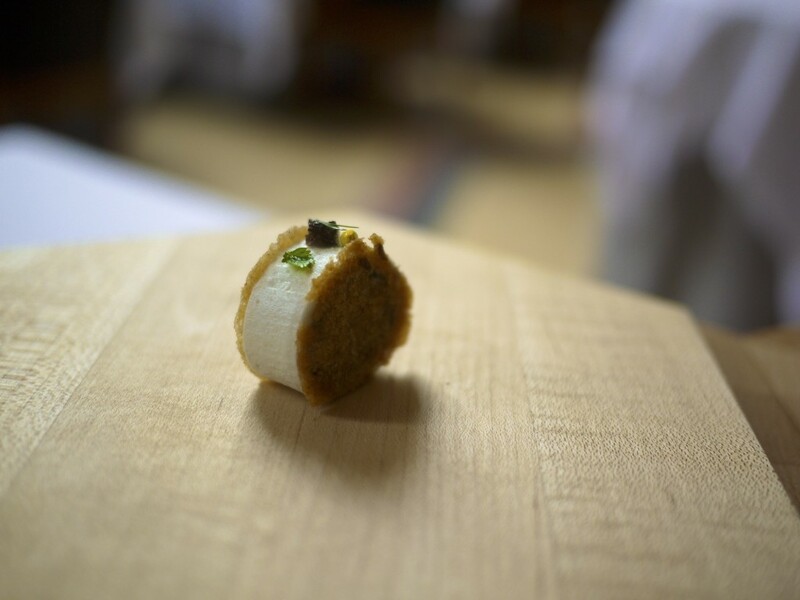 They then disassembled it to reveal an array of amuse bouche that were hiding underneath. 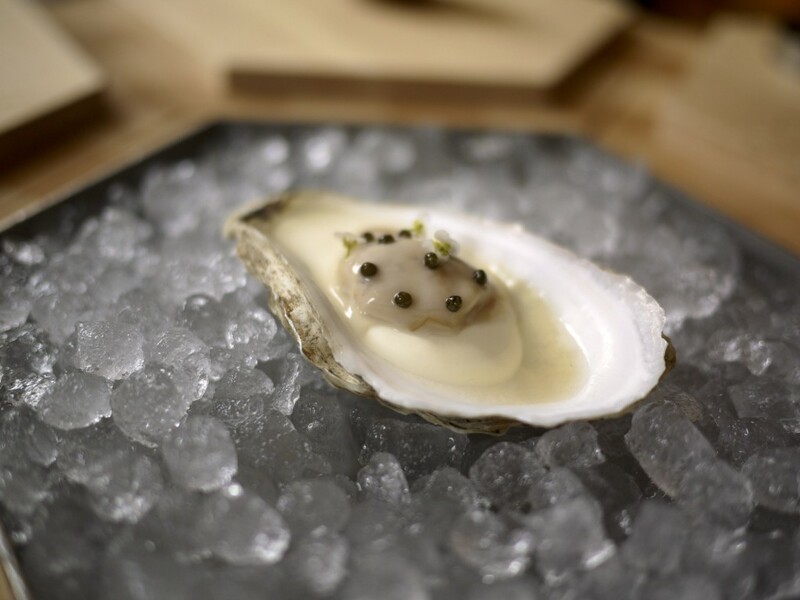 Amuse Bouche 2: Wellfleet oyster with caviar. This was the only disappointing dish of the evening. I was rather looking forward to tasting the local oysters but sadly the all important natural flavour of the oyster was completely lost. Amuse Bouche 3: Morel with rye crisp which had a good sharpness and acidity from the vinegar that cut right through the mushroom. Lovely textural contrast of the rye crisp against the slithery morel disc. This was more like it. 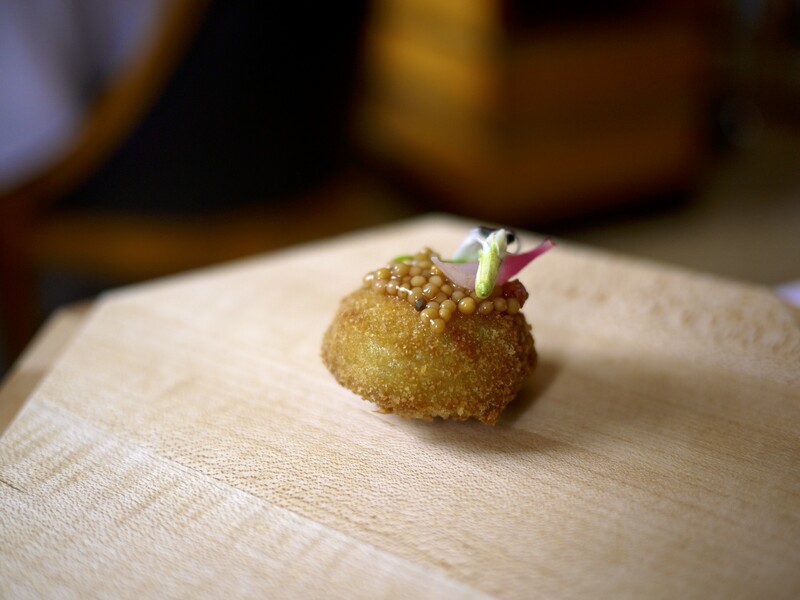 Amuse Bouche 4: Fava bean croquette served with mustard grains. 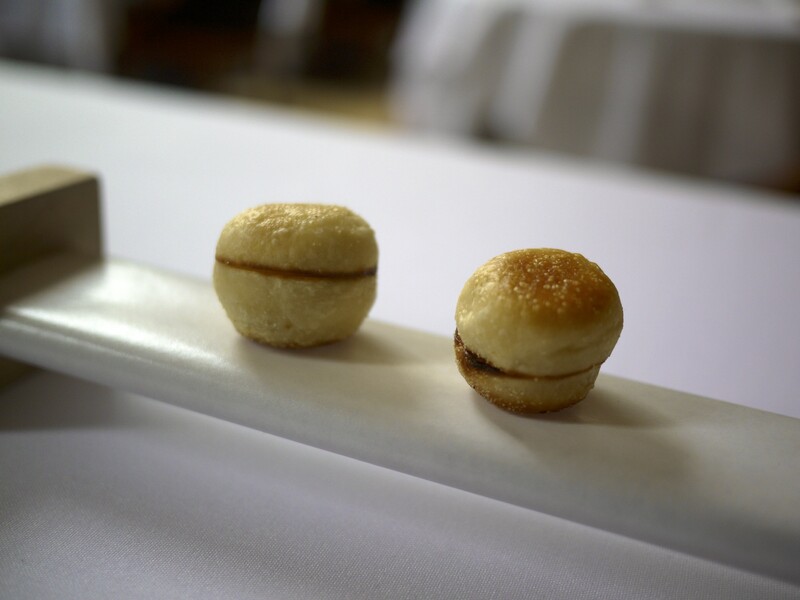 Good introduction of a warm element in the amuse bouche series and the distinct flavour of mustard was surprisingly pleasant. 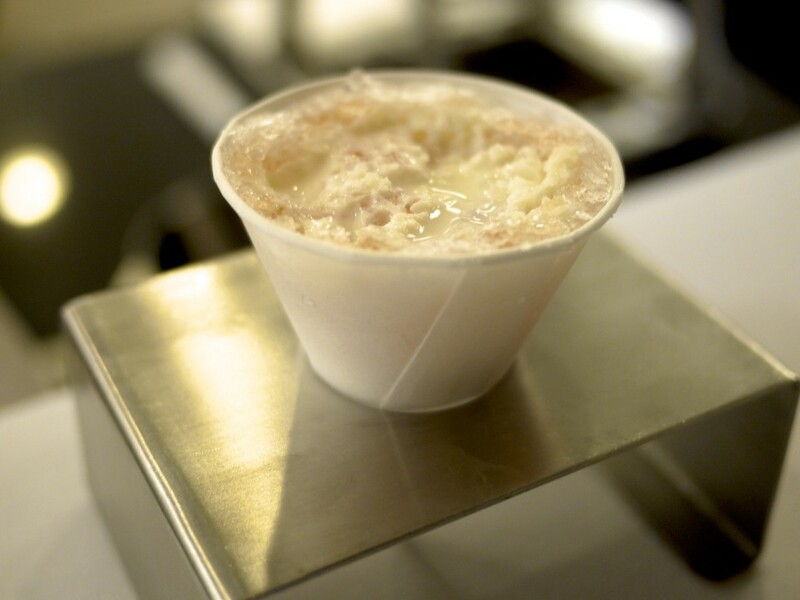 Amuse Bouche 5: Whitefish salad which consisted of a sturgeon mousse hiding underneath a layer of trout roe. To the left above was a mixture of crispy fish flakes and herbs. I was advised to take the radish and sugar snap and dip into the two containers. The smokey mousse and trout roe were divine, but so were the crispy fish flakes. I did not hesitate, polishing this up using the spoon despite having run out of vegetables to dip into. It was heavenly. Course 1: Caviar, Benedict with spring onion and ham. 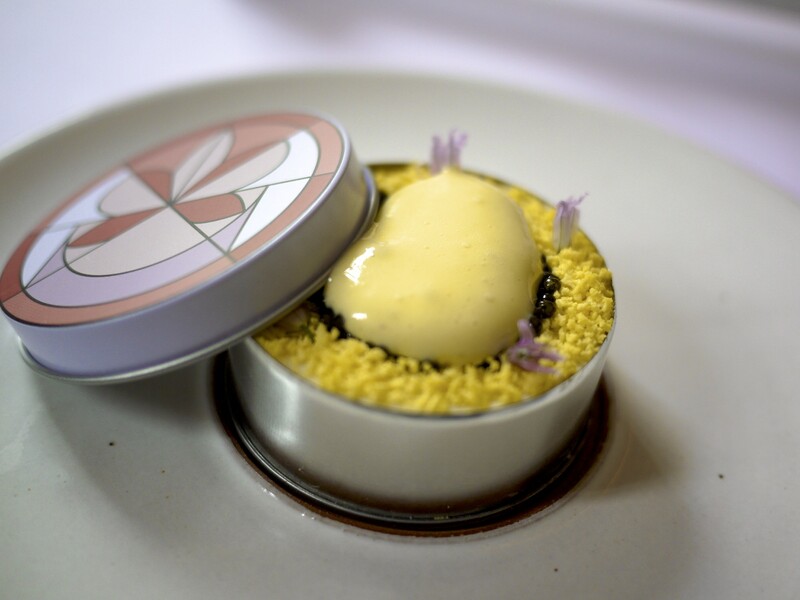 A modern take and homage by the Swiss chef on the classic New York dish of egg’s benedict, served in a geometric patterned tin box that mirrored the dining room’s art deco design. 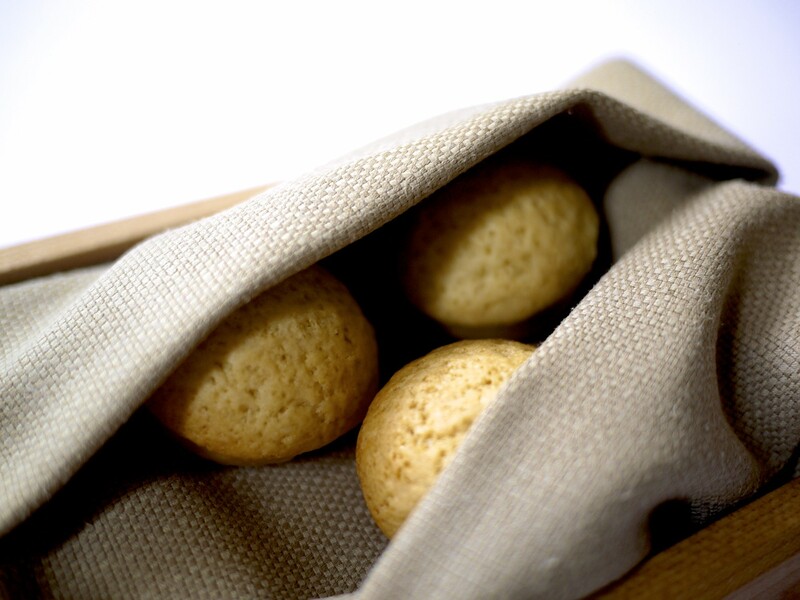 … some homemade English muffins which were pleasant. I know it may sound rather crazy but despite even the generous amount of black caviar this dish just didn’t do it for me. Sure it was rather decadent but I found there were too many components that, in combination, amalgamated to a non-distinct flavour that was salty and rich. I personally felt the chef could have simplified this dish a bit more to draw out some individual flavours that tasted delicious individually. A handful of individuals were whisked away during the course of their meal that afternoon to explore the kitchen and I was fortunately one of them. The Chef de Cuisine Chris Flint stopped momentarily to welcome me before going back to the running the pass. My guide from the front of house then immediately drew my attention to the Miles Davis print and words of inspiration that had been framed up. He continued to explain that Chef Daniel Humm had decided to answer one of his critics for the lack of ‘Miles Davis’ by quite literally bringing him into the kitchen. And who says the Swiss don’t have a great sense of humour? Or perhaps he wasn’t joking! Before being led out of the kitchen I had one last surprise which was a palate cleanser. 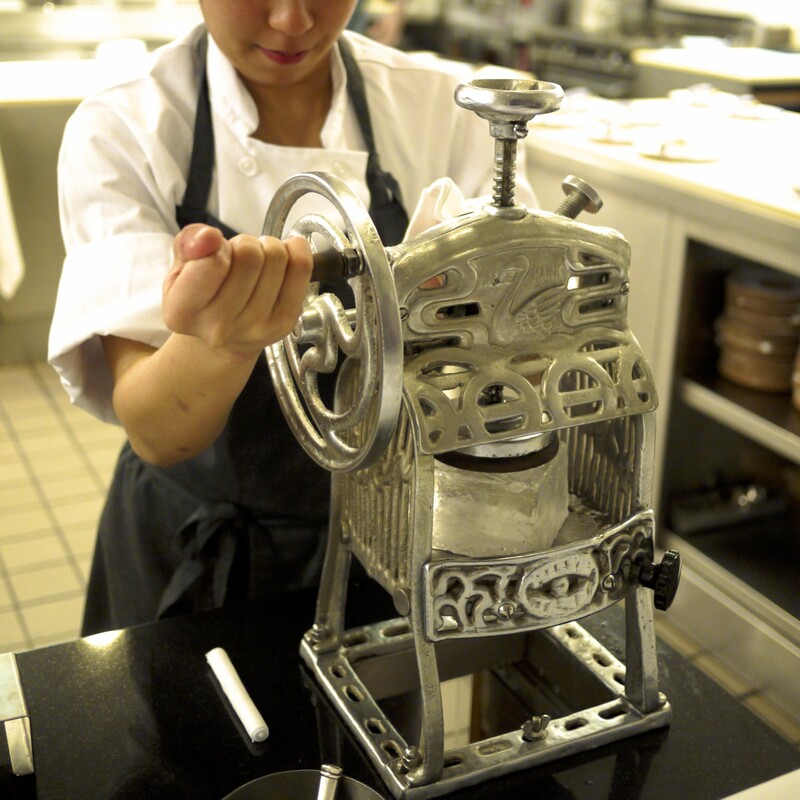 One of the chefs came out with a block of ice and started shaving it using an antique ice shaver they found in the Bronx. Palate cleanser: Snow cone with rhubarb and gin concoction that was pleasant and refreshing. A flavour combination I wouldn’t have thought of but worked rather well. I felt like a kid just for that moment and it took me back to the hot Japanese summers of my childhood. 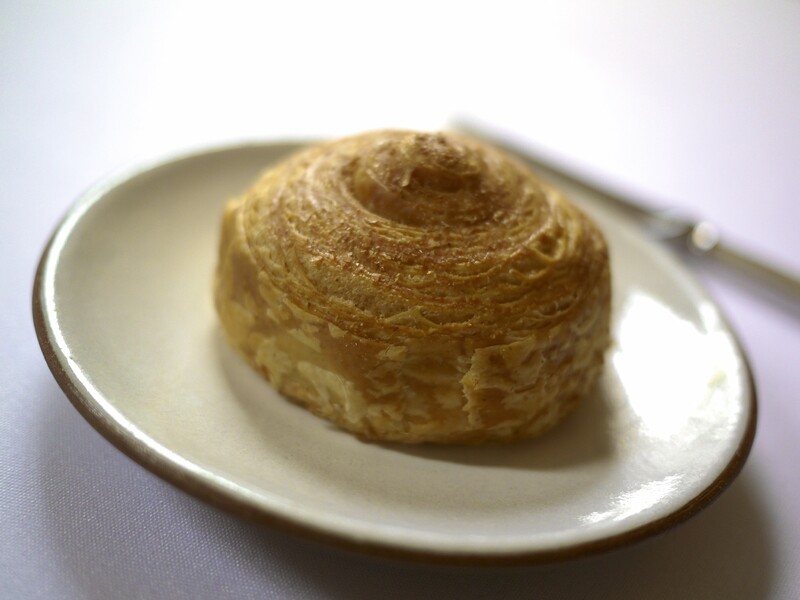 … an organic bread made with half white and half whole wheat flour, which had a lovely texture not dissimilar to a good croissant that flaked as you bit into it. I ended up asking for two more serves because it was that good. There’s a lot to be said about good home made bread. Course 2: Foie gras served with sorrel and fava beans. 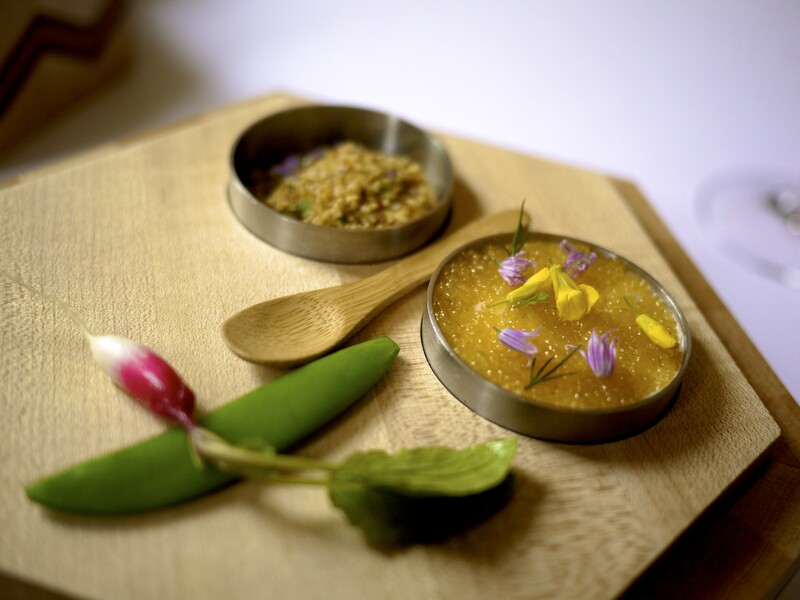 The locally sourced foie gras was perfectly seared and sandwiched between a bed of fava beans and a layer of meyer lemon marmalade, amaranth marmalade and sorrel leaf on top. 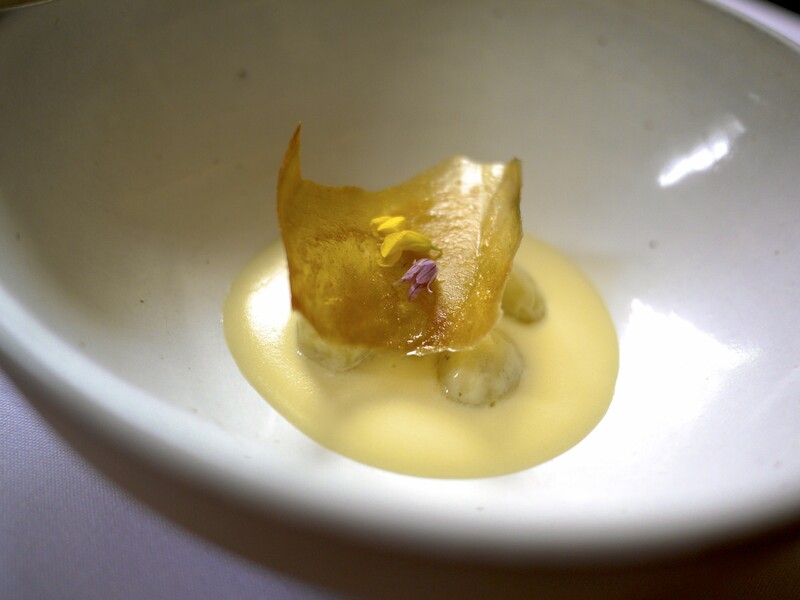 To the side was a delectable smoked wood sorrel sauce that brought the dish together. 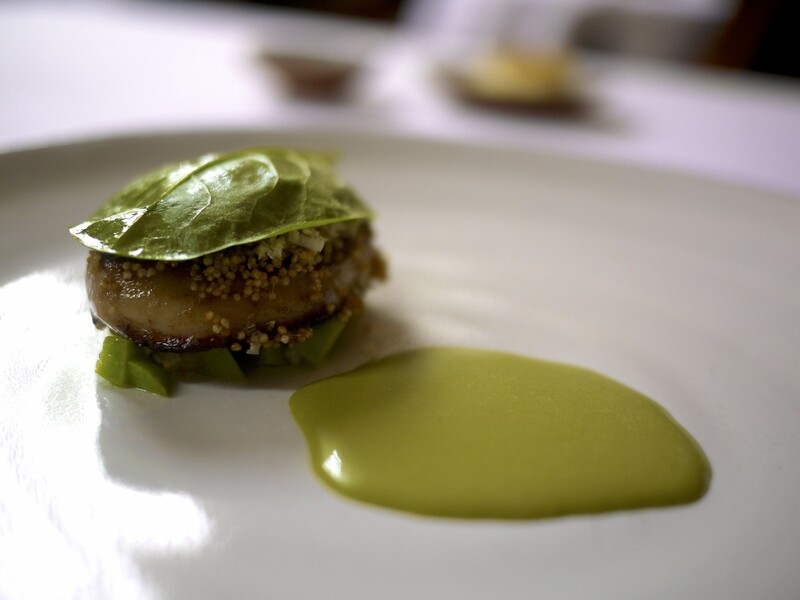 Each component added value, from the peppery note of the amaranth to the smokiness of the sorrel sauce. Who would have thought of putting all these ingredients together? This dish was not only delicious but also different. 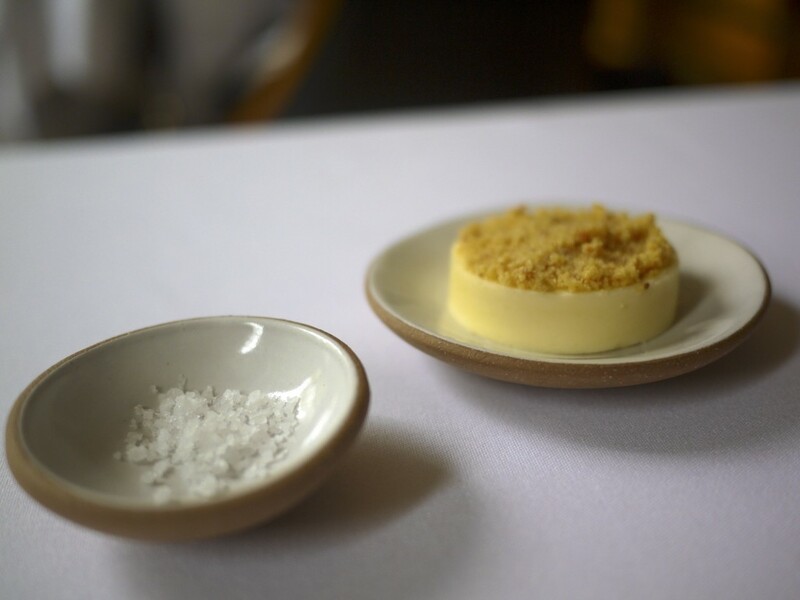 It was one of my favourite dishes without a doubt during this service, and in my top three foie gras dishes. As I wasn’t after getting each course matched with a glass of wine, I asked the sommelier for a recommendation to go with the first few dishes including the foie gras. 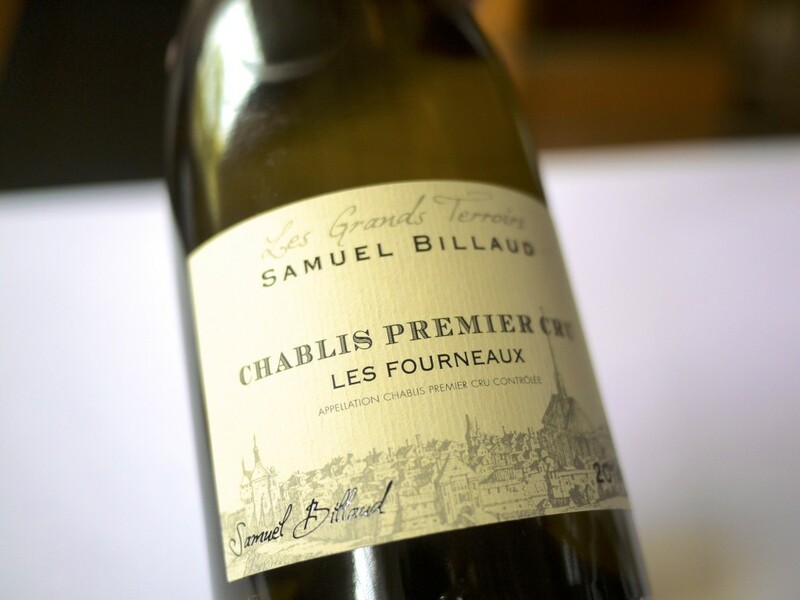 I was poured a glass of a 2014 Samuel Billaud, Les Fourneaux, Premier Cru, Chablis, France. Course 3: Lobster butter-poached with morels and peas. 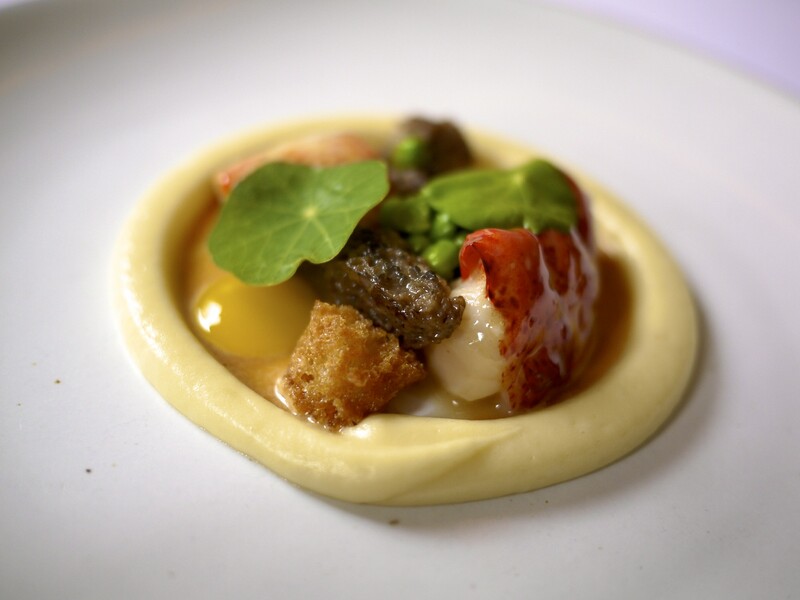 The butter poached lobster from Maine was juicy and married ever so well with the porcini infused mashed potato ring and the slight hint of sweetness of the peas. 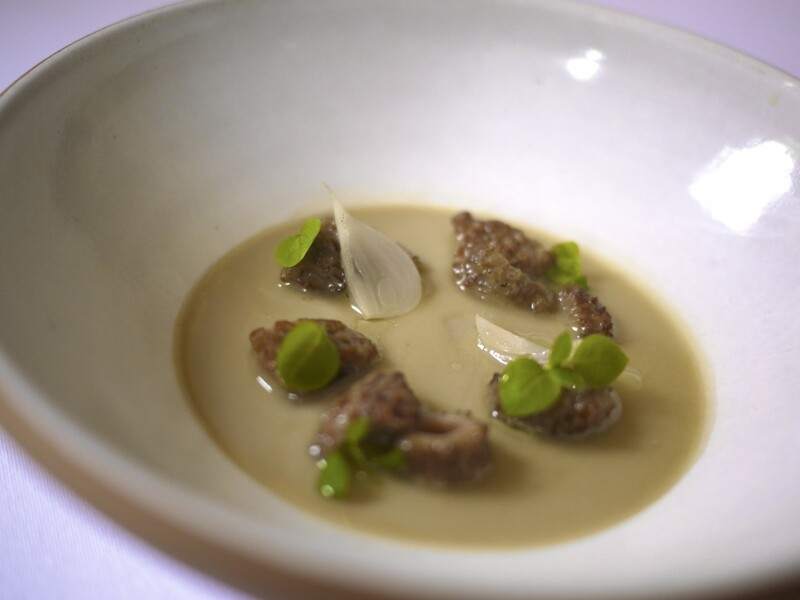 I particularly enjoyed the textural crunch of the crumbed sweetbread that had soaked up the lobster bisque. Prior to the next dish being presented, the sommelier had suggested moving on to the Syrah although he noted the chablis was equally adequate to match the next course. I obliged but the Syrah was forgotten, only for the sommelier to cover up the mistake by advising me afterwards that he thought, after all, the chablis was better suited. To be honest, we’re all human so a simple sorry would have been sufficient (and preferred). Moving swiftly on to the next course, there was some theatre by way of a table side gas stove. 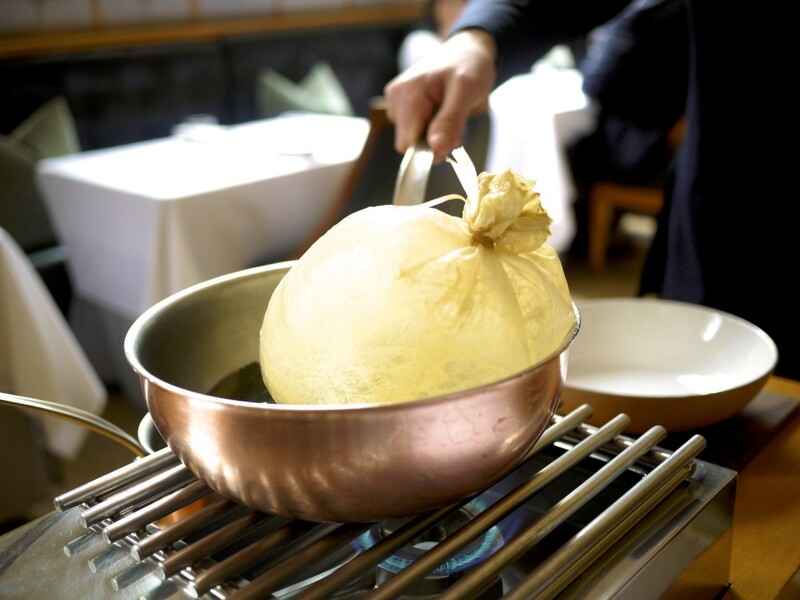 Inspired by the ‘Poulet de Bresse en vessie’ from Paul Bocuse, this dish similarly cooked the main ingredient of the next course in pig’s bladder to keep the content moist whilst basting it. 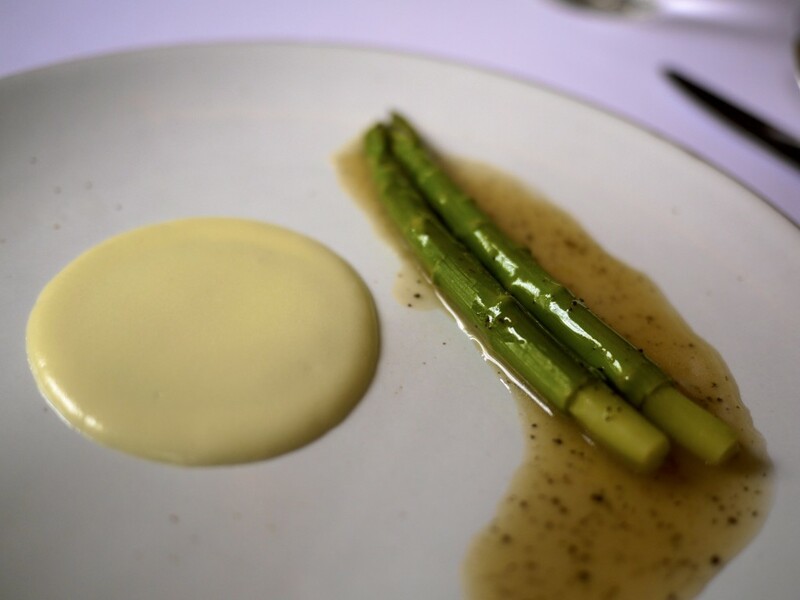 Course 4: Asparagus braised with potato and black truffle – The inflated pig’s bladder was cut open, revealing two moist and tender asparagus sourced locally from Hudson Bay. It was dressed with a deliciously rich pork and Perigord black truffle jus and a dollop of more black truffle purée. The jus and asparagus in my view were the stars of this dish and I perhaps could have done with a bit more purée to mop up the jus. 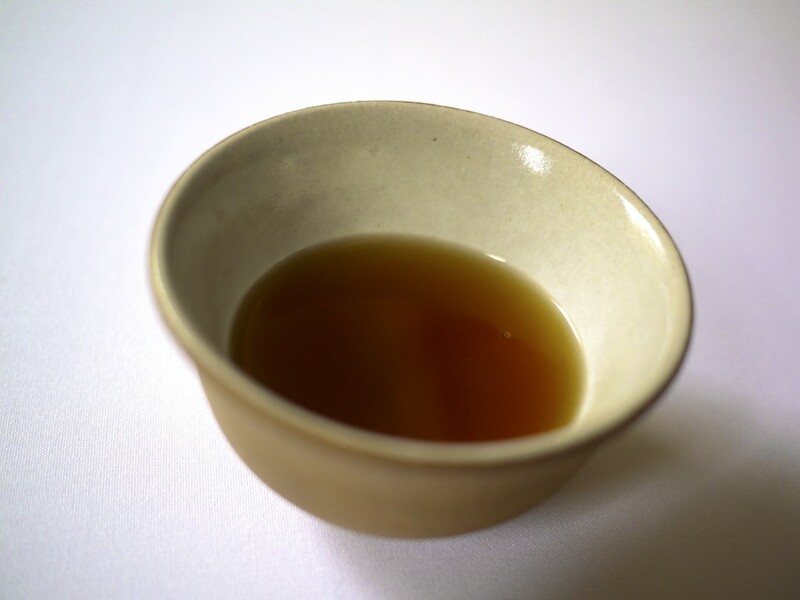 As a precursor to the next dish, a rich and sticky duck broth was served in a beautiful tea cup. It had a remarkable depth to the flavour which no doubt was a result of hours of reducing. 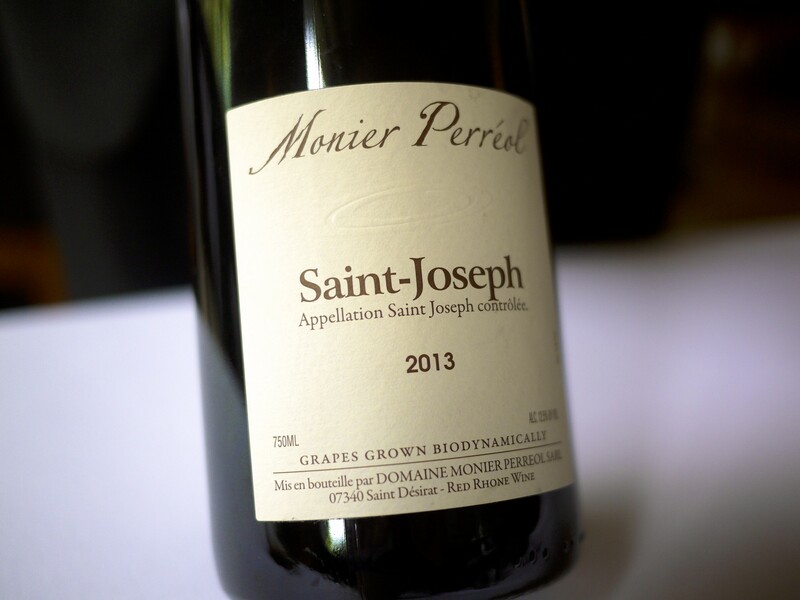 My glass of the Domaine Monier Perréol, Saint-Joseph, Rhône Valley, France 2013 was finally poured to match the next course. 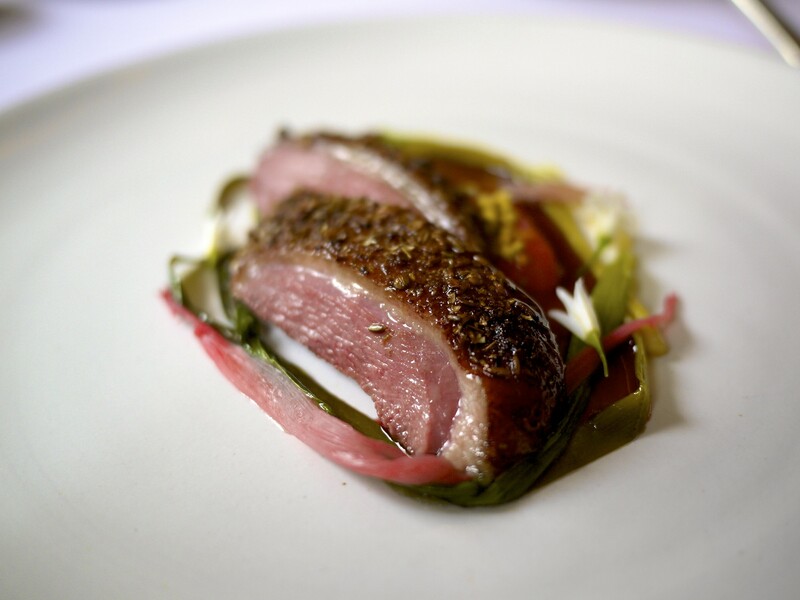 Course 5: Duck, honey and lavender glazed with spring onion and rhubarb – The dry aged duck breast from Ithaca was coated in Sichuan pepper, lavendar, coriander and cumin before being whole roasted and subsequently served with some citrus jus. The spice mixture was very balanced and the all important bird tender, but not chewy. Another thumbs up. Side dish 1: Two side dishes accompanied the duck course starting with the morel custard with spring garlic which had a great earthy flavour and… Side dish 2: Some new potatoes variations with flowers. The new potatoes were served in its entirety and as thin shavings of crisps. Course 8: Nancy’s Hudson Valley Camembert with rhubarb, sorrel and green garlic – A few ordinary looking bread rolls were presented but they turned out to be stuffed with camembert. 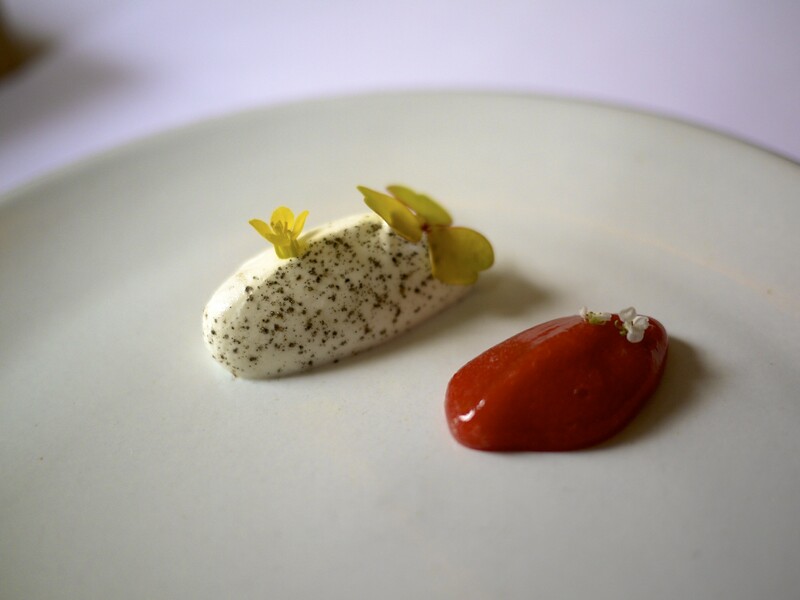 They were served with… … a rhubarb purée and a sorrel and green garlic crème fraîche. The cheese oozed out of the bread and worked well with the condiments. However, I would have preferred a proper cheese course for the simple reason that I wanted to eat the cheese and not the bread. I was getting quite stuffed by this point. 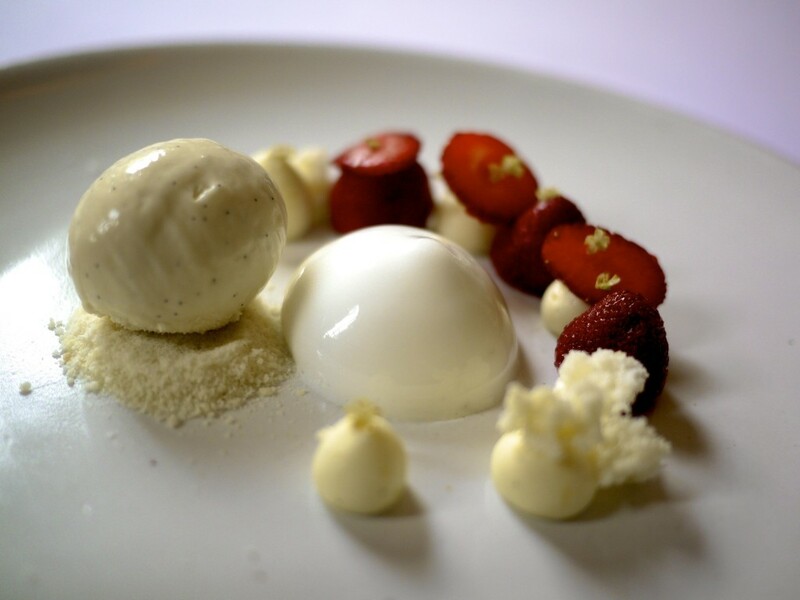 Course 9: Strawberries poached with vanilla and elderflower – A tingling sensation from the elderflower foam, rich and creamy vanilla ice cream, and sweet strawberries poached in elderflower and vanilla. Sadly, this was the only dessert course of the meal! Certainly an unusual situation in the fine dinning world. I couldn’t recall having a tasting menu in the last couple of years with only one dessert. Course 10: Chocolate “Name that milk” – I’m not sure whether I would describe this as a course but it was presented as a game where the diner had to match the four chocolate bars to an animal on the card on the left. 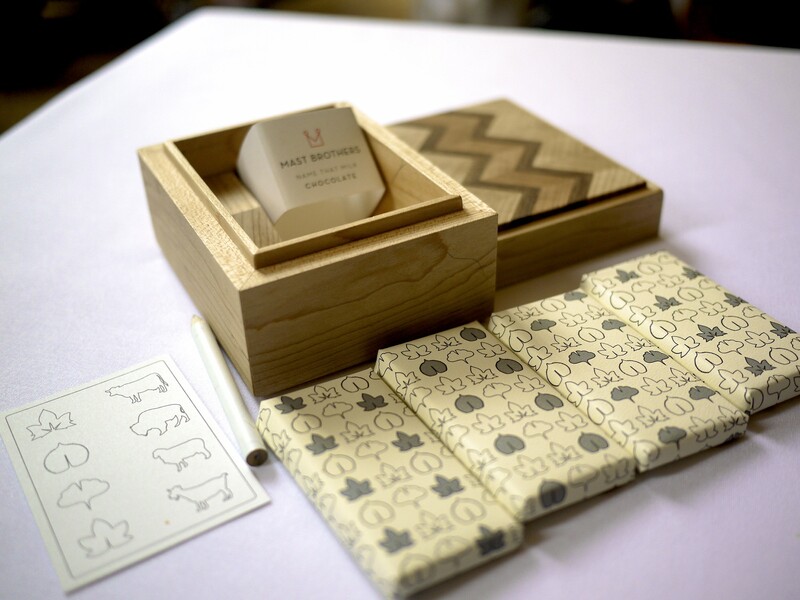 Each chocolate bar was made using the milk from a cow, sheep, buffalo or goat. I managed to get the cow right and found the sheep’s milk chocolate unpleasant. 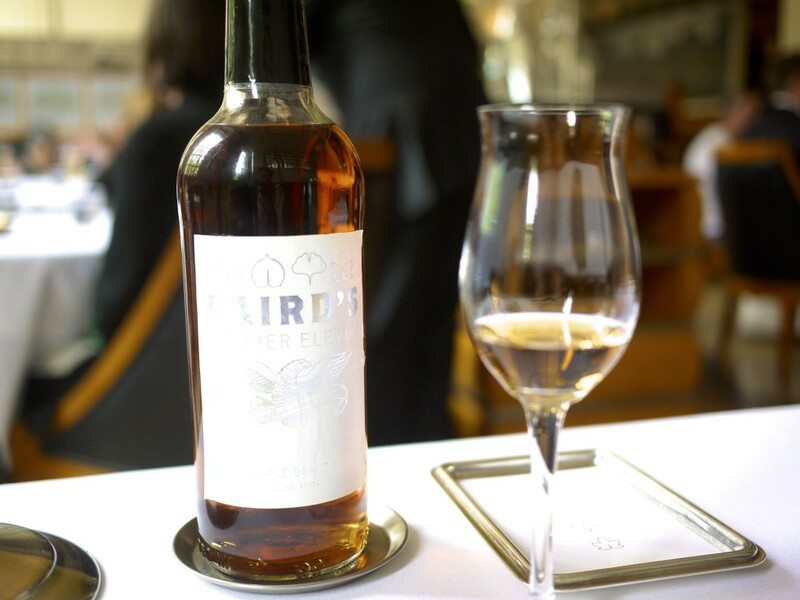 Digestif: A bottle of Eleven Madison Park’s own house cask of Laird’s Applejack, an apple brandy distilled nearby in New Jersey. I was told to help myself to as much as I wanted but alas I had another appointment to get to and therefore had to settle with just one glass. I’m not a brandy man but found this rather pleasant and refreshing. With a bit more time up my sleeve and it could have been a bit dangerous. 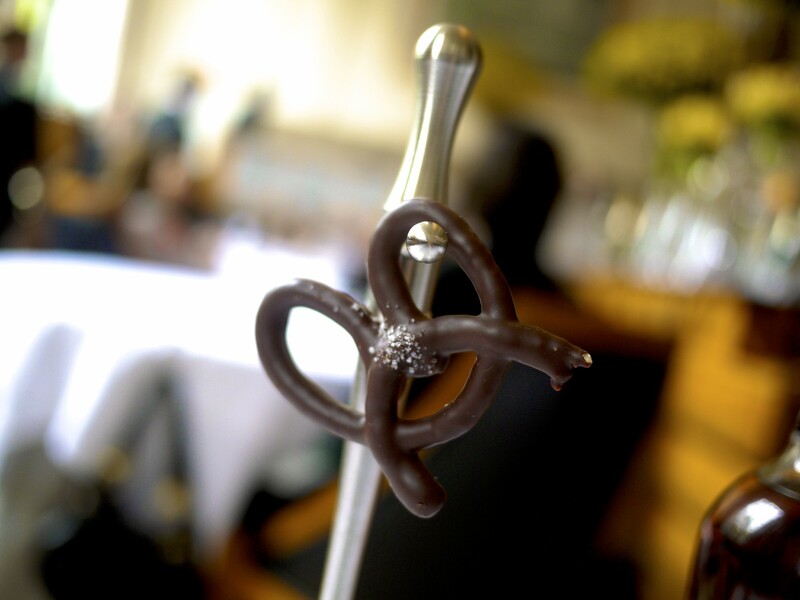 A chocolate pretzel with sea salt came with the brandy to end the meal. 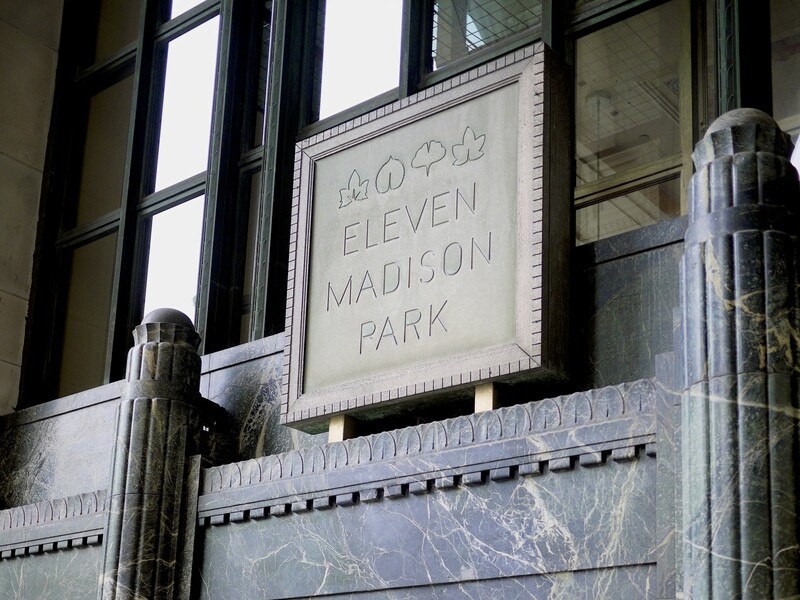 To sum it up, the meal at Eleven Madison Park was enjoyable and pleasant but lacked that special something that defines most restaurants in the Three Michelin Star category. The front of house was superb and almost faultless, and I loved the fact that almost all the courses had a story and a connection with a local artisan or producer. The cooking was also solid and dishes perfectly executed, but I found there was not enough of the ‘wow’ factor. I was glad to have come here but I’m not sure whether I would travel again half way around the world for a second reservation. 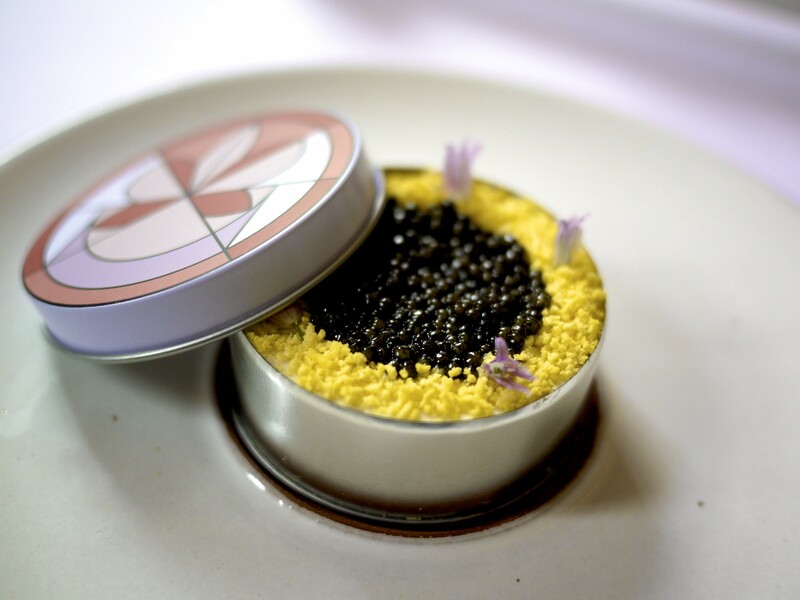 This entry was posted in United States and tagged Daniel Humm, Eleven Madison Park, Hudson, Ithaca, New York, Petrossian caviar, San Pellegrino, United States, USA on May 29, 2016 by admin.